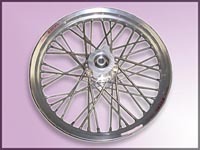 Rear Quick Change Wheel Assembly : available in 17”, 18” or 19”. 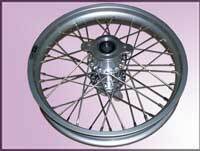 The rear quick change wheel will arrive completely assembled, laced and trued-up. 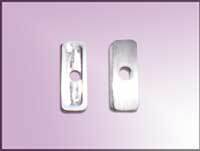 Available for 32, 36 or 40 hole styles. 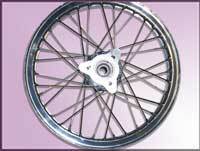 Includes the rim, quick change hub, 25mm sealed bearings (2), sprocket/disk ccarriers (2), spokes and knock off nuts. 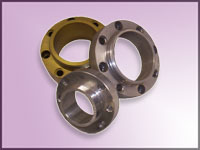 Available in either a 4" wide hub or a 5" wide hub. The benefits of a 5" wide hub produces a stronger rear rim. 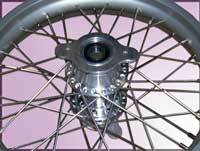 The way this works is the wider hub spreads apart the flanges, thus increasing the angle of the spoke to the rim. This combination provides moer stability and less flex when riding at an angle. 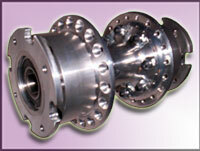 The 5" wide hub uses either 5/8" or 3/4" carriers. 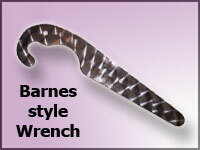 Tire, spacers, axle and knock off nut wrench not included. 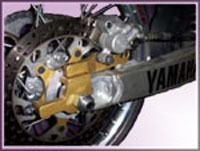 Quick Change Adapter Kit is designed to hold primary components in place along the swing arm while the racer removes the rear tire. 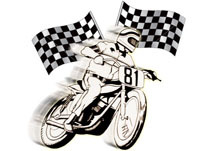 Once the tire is removed you may replace it with another tire already setup with quick change adapter components or flip the wheel around (along with the brake disk and sprocket) and replace it in a short amount of time. 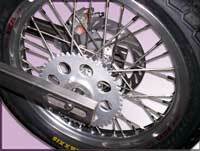 By changing the tire around, the rider is given the opportunity to utilize both sides of his tire. You can save money by using your own rim. 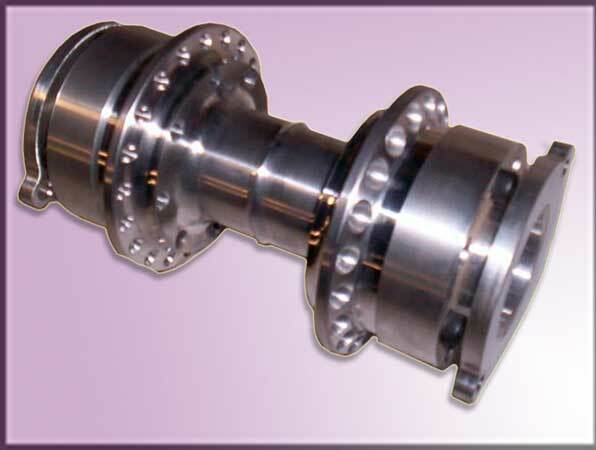 The rear quick change hub is available in either 4" or 5" wide hub (32, 36, & 40spoke hole styles), 25mm sealed bearings (2), sprocket/disk carriers (2) knock-off nuts (2), carrier bolt set and spokes. 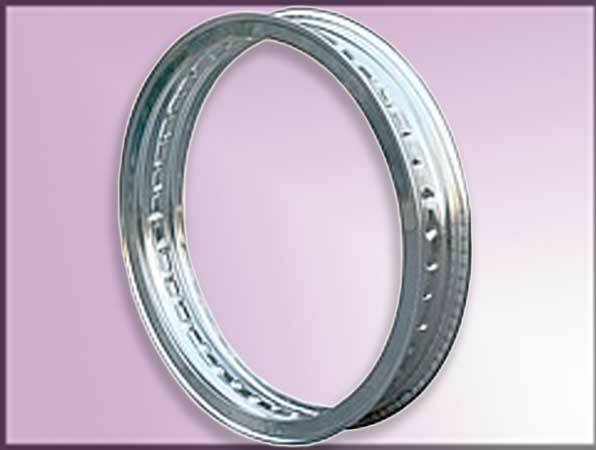 A 5" wide hub produces a stronger rear rim. The way it works is the wider hub spreads apart the flanges, thus increasing the angle of the spoke to the rim. 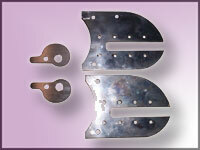 This combination provides more stability and less flex when riding at an angle. 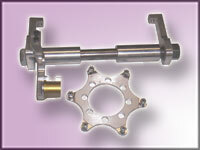 The 5" wide hub uses either 5/8" or 3/4" carriers. 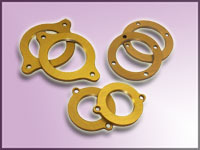 We offer quick change hubs with the bearings either in the center hub or in the sprocket/disk carriers Bearings located inside the carriers versus inside the hub spreads the torque closer to the swing arms, which takes pressure off the axle and bearings. Results in more Straight pressure versus flex pressure due to bearing placement being more inline with the Chain and brake disk. 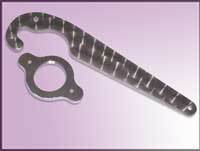 This creates less swing arm flex. see Sprocket/Disk Carriers below for pictures of the various styles.. .
Picture #1: Components that make up the Rear Quick Change Hub Assembly. 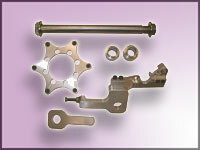 Shown with standard knock-off nuts (2-wing) and bearings located in the hub. Picture #2: Rear Quick Change Hub Assembly with Bath-tub knock-off nuts (no wings) and notice this set-up is pictured with the bearings located in the sprocket/disk carriers. 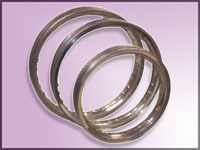 Bearings located inside the carriers versus inside the hub spreads the torque closer to the swing arms, which takes pressure off the axle and bearings. 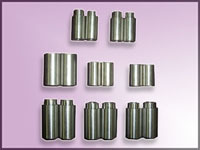 Results in more Straight pressure versus flex pressure due to bearing placement being more inline with the Chain and brake disk. 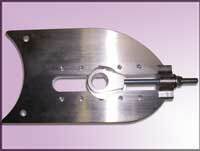 This creates less swing arm flex. Picture #3: Rear Quick Change Hub Assembly with 4-hole knock-off nuts (no wings) and the bearings located in the sprocket/disk carriers. 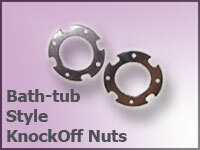 Picture #4: Mini Bike Rear Quick Change Hub Kit Assembled with Mini Bike knock-off nuts. 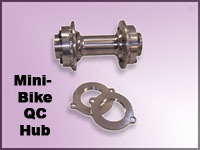 Picture #5: Mini Bike Rear Quick Change Hub Assembly with Mini Bike knock-off nuts. 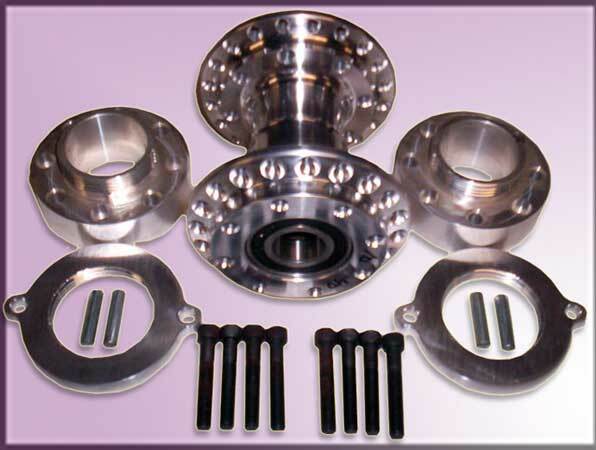 This picture shows the different components: center hub with bearings, sprocket/disk carriers (2), knock off nuts (2), and carrier bolt set. 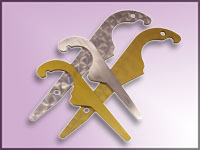 All products also sold individually. 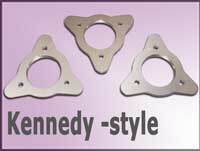 3 1/2” x 4" wide Rear Hub, 20mm sealed bearings (2), sprocket/disk carriers (2), knock-off nuts (2) and spacers(2). 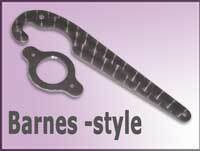 For standard "Barnes-style" rear quick change hubs. 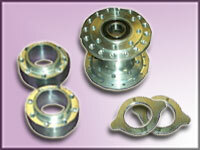 Picture #2: Shows disk carriers that have bearings embedded in them. 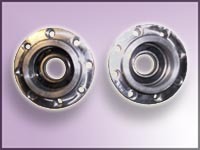 Bearings located inside the carriers versus inside the hub spreads the torque closer to the swing arms, which takes pressure off the axle and bearings. Results in more Straight pressure versus flex pressure due to bearing placement being more inline with the Chain and brake disk. 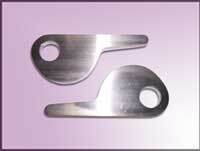 This creates less swing arm flex. 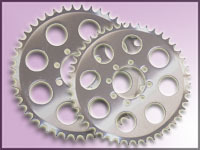 Each sprocket/disk carrier has 8 holes for attachment to the hub. Four of these holes are countersunk requiring shorter bolts and the remaining four holes require longer bolts. 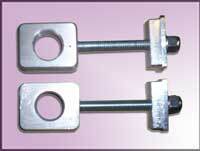 Each set of bolts contains a total of 8 bolts (4 bolts of the shorter length and 4 bolts of the longer length). 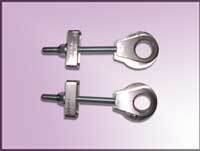 Each carrier will require one set of 8 bolts to attach to the sprocket/disk carrier. The Mini Carriers only require 4 bolts. 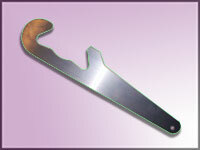 Please specify lengths when ordering. 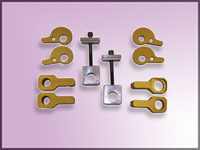 Bolt sets sold with carrier purchases only. 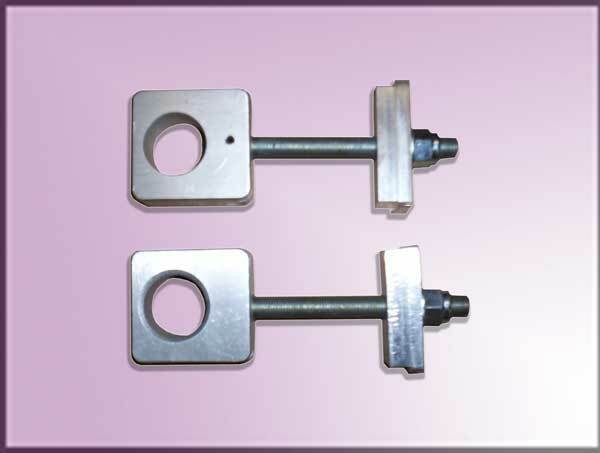 Mini Carrier Bolt Set = a combination of four 1/4" by either 1" or 1 1/2" which works with Miki Bike carriers or the Front TT Hub. 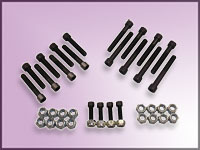 Short Bolt Set = a combination of four 1 1/2" & four 1 3/4" which works with a 5/8" or 3/4" wide carrier. 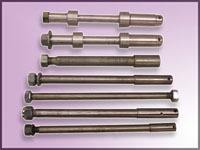 Medium Bolt Set = a combination of four 1 3/4" & four 2" which works with a 1" or 1 1/8" wide carrier. 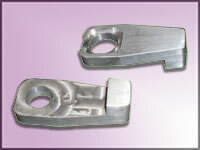 Long Bolt Set = a combination of four 2" & four 2 1/4" which works with a 1 1/4" wide carrier. 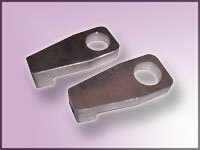 These Axle Mount Plates work with the Sonic Weld frames. 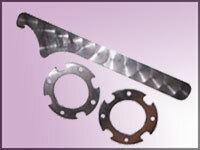 Sprockets : available in various sizes. 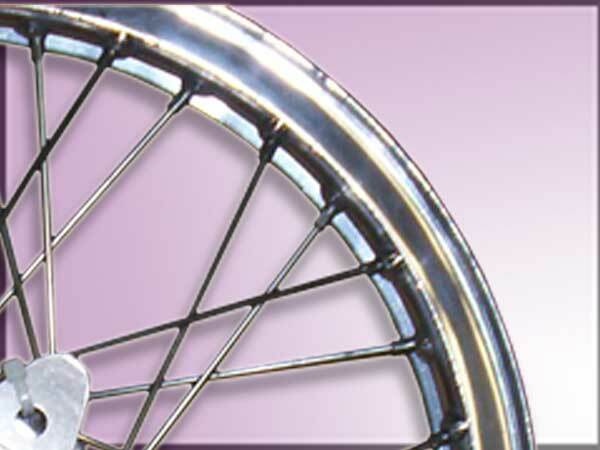 Rims only : available in sizes listed below.